A chainsaw is an essential tool for anyone who needs to cut down trees or deal with thick pieces of wood. For those who will only be using their chainsaw for occasional projects, a small saw is a way to go. The best small chainsaw can help you with yard work, home improvement, and many other things. With so many chainsaws on the market, it can be difficult to find the best small chainsaw. When shopping for a small chainsaw, you’ll need to find the perfect balance between function and size. In this article, we’ll cover how to select the best small chainsaw for your needs, and we’ll also review the best small chainsaws on the market. 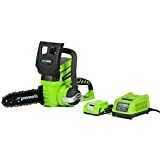 What Can I Use A Chainsaw For? A chainsaw can be used for many different things. Traditionally, chainsaws are used for cutting down trees and dealing with lumber. They can also be used for pruning your trees and bushes. In some cases, they can also be used for home improvement projects, although there are likely smaller tools that will do these jobs more effectively. What Are The Benefits Of Having A Chainsaw? Chainsaws, especially small compact ones, are ideal to keep in your garage if you have trees in your yard or live near a forest. A chainsaw makes it easy for you to maintain the foliage in your area and keep your yard looking nice and neat. Chainsaws can cut through wood quickly and neatly, so you won’t end up with debris all over your yard after using one. A chainsaw also makes the process of cutting wood and maintaining the trees in your yard much more efficient, so it won’t take you all day just to prune a few bushes. 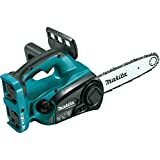 How Should I Select A Small Chainsaw? The best small chainsaw is for homeowners or other people who might only need to use this tool a few times per year for maintenance. When looking for a basic home chainsaw, the smaller the size, the better. Larger chainsaws will be more difficult to use and maintain. Generally, you should look for an electric chainsaw if you will only be using it for personal yard maintenance. Electric chainsaws require much less maintenance than gas chainsaws, and they are usually easier to use as well. When you are using a chainsaw for the first time, you should look for an option that has a guide bar of fewer than 18 inches. Anything larger than that will be too difficult and unsafe for a new chainsaw user. This is because the longer the guide bar is, the more dangerous it will be if you experience any kickback, which is when the guide bar hits a foreign object and starts rotating backward instead of forwards. You’ll also need to consider the weight of the chainsaw, as you’ll need to be able to lift it without struggling. When comparing small electric chainsaws, it’s important to look for options that have a long battery life. The longer the battery life, the more work you’ll be able to get done without having to stop and charge or replace the battery. You’ll also want to consider the chainsaw’s source of power and the length of the cord. Many electric chainsaws need to be plugged in during use, which may limit where you can use them. For casual chainsaw users, you should also look for safety features to make the tool easier and more comfortable to use. Using a chainsaw is not something to take lightly, as there is plenty of potential for injury and property damage if you do not know what you are doing. Good safety features (and caution during use) can prevent accidents. You should make sure the chainsaw you purchase has an easy stopping mechanism at the very least. What Should I Avoid In A Chainsaw? When searching for a small chainsaw for home use, you should avoid anything that is too large or difficult to maneuver. This will be very dangerous for the casual chainsaw user. You should also avoid chainsaws that do not have any protective measures to prevent kickback and other accidents. You will need to be very cautious when using your chainsaw at first, so don’t be afraid to shop around until you find an option you are completely comfortable with using. This chainsaw provides tons of power considering its size and electric motor. The engine has 14.5 amp motor output, which makes it work similarly to a more powerful gas chainsaw. This is ideal if you have very large trees in your yard that you need to maintain. The 16-inch size is large enough for many different projects, but not so large you won’t be able to handle it safely. This chain system on this saw maintains the correct level of tension on its own, so you won’t have to manually tighten or loosen it. It also has an oil reserve that automatically lubricates the chains. It also has a chain brake and low kickback bar to keep you safe during use. The saw is relatively light and easy to maneuver and is comfortable to hold as well. It does have a cord, which may limit where you can use this saw. It has a very strong 14.5 amp motor output. The 16-inch guide bar is easy and comfortable to handle. It automatically maintains chain tension and lubricates, reducing maintenance time. The chain break and low kickback bar keep you safe. The cord can make working on some projects inconvenient. This small chainsaw is ideal for anyone who is using this type of tool for the first time. The 10-inch bar is relatively small, but it works well for cutting tree branches and maintaining your yard. 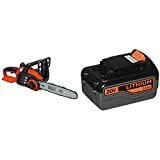 A huge advantage to using this chainsaw is that it is cordless and has a rechargeable battery, so you can use it anywhere and don’t have to worry about replacing the battery frequently. There are two battery options which can be purchased separately, lasting either 45 minutes or 90 minutes. It is very easy to maintain – it automatically lubricates the chain, and you can easily adjust the tension if you need to without any extra tools. The chain moves very slowly, which makes it safer to use for beginners. It’s also lightweight and ergonomic, so it’s easy to hold onto. However, it’s important to note that you may experience some oil leakage while using this product. This is a very occasional occurrence and does not have any effect on the way the device works. This device is small and lightweight, making it very easy to use. It is battery operated, easy to recharge, and lasts for a long time. It’s great for beginners because the chain moves slowly. You may experience some leaking from the oil tank. It may not be large enough to cut some tree branches. Black + Decker makes many variations of this chainsaw in different sizes, but this small one is good for beginner saw users. It has a 10-inch low kickback guide bar for safety and ease of use. It is lightweight and has a wraparound handle that is very easy to maneuver, which makes cutting easier regardless of your strength level. It oils the chain automatically, and you can adjust the chain tension on your own, without the help of tools. It uses a 20-volt lithium-ion battery that can be recharged, so you can use it anywhere without a cord. The battery lasts for up to 150 cuts and can hold a charge for a full year if necessary – ideal for the casual saw user. This chainsaw is also very durable – it is made of a combination of metal and plastic and can last for years. Be aware of this product that you may experience issues with the chain oiler. Some customers have found that you have to manually apply oil yourself. It is very easy to maneuver, as it weighs only seven pounds and has a large, easy to use the handle. The battery lasts for a long time, and the construction of the saw is very durable and sturdy. While it does have an automatic chain oiling function, it is inconsistent and may not work. This powerful chainsaw is ideal for the experienced saw user who still wants something small and appropriate for home use. The 14-inch guide bar is big enough to cut larger trees but is still a maneuverable size. It also comes in a 12-inch version if you’d prefer something even smaller. It uses a pure fire engine, which results in very powerful performance and efficient fuel usage. It also starts and warms up quickly. It automatically oils the gears, and it has a mechanism that allows you to easily adjust the chain from the side. It has a sprocket nose bar, which makes cutting go more smoothly and keeps you safe. It is also very light for the size, so you won’t need to exert too much energy to cut safely. Because of the lightweight design, the chain bar may loosen over time due to vibration. Be sure to check the condition of your saw periodically to prevent any safety hazards. It is powerful enough for larger trees while still being very light. It uses fuel efficiently and is quick to start and warm up. The chain bar may loosen over time. It may be louder than a battery-powered chainsaw. 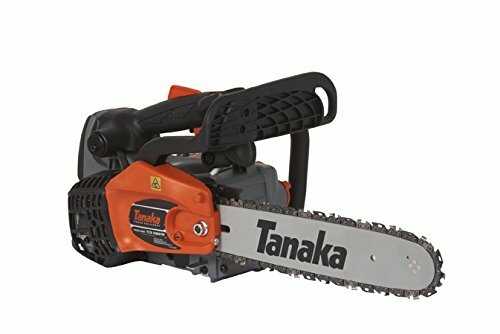 This chainsaw is compact and convenient to use. It uses two 18 volt lithium ion batteries for power, so you don’t have to worry about a cord or a cumbersome gas engine. The batteries can last for at least an hour at a time, depending on when they have most recently been charged. The 12-inch guide bar is safe and easy to use, and the saw is also very quiet. The chain is easy to adjust, and it has a fast cutting speed for increased productivity. It is also quite strong and can cut through large trees and branches with minimal effort. It does need to be manually oiled, which may be a downside for some users. However, oiling the saw is not difficult. It is very convenient to use because it does not need to be plugged in. The battery life is fairly long as well. It is light and easy to use, but still powerful enough to cut down large branches if the need arises. The small size makes it safer for beginner users. It needs to be oiled and tension adjusted manually. All of these chainsaws are very effective for home use and are safe for the beginner chainsaw user when the proper precautions are taken. Although each chainsaw we reviewed here offers good quality, we recommend the GreenWorks 10 inch chainsaw because of the simple, lightweight design and good safety features. A chainsaw is a great investment for any homeowner who wants to do their lawn maintenance themselves, and it’s important to spend your money on a product that provides great quality and is safe to use. These are our picks for the best small chainsaw I hope you agree with our picks.